The SSS Flash mixture is consisting of both "Crinkle strands", "Mirage" and "Mirror strands" and a little bit of HD SSS Angel Hair gives a flash mix that is just completely raw! It doubles just fine, soft and swimming, and how hard I rub it does not tangle! Here you will find the 15 great SSS blends suitable for everything from the lightest to spice up the darkest night fly. The flash is not to stiff but still not to soft to tangle. A flash mix that swim the right way... SSS Flash comes in 15 color blends. SSS – Angel Hair HDHD stands for heavy duty. This is a heavier type of Angel Hair. The material is somewhere between common flash and the original Angel Hair quality. Many times you experience the common flash to be too heavy and the Angel Hair too thin. Voila! The solution was Angel Hair HD. I have longed for this material for a very long time. This material replaces the flash in small flies and the Angel Hair in the bigger ones. This kind also comes in 15 different color blends. You get the whole color chart with the three hot, fluorescent colors as an extra spicy alternative. SSS – FlashThis is my own flash. It is the same mixtures as in the Angel hair qualities. It’s simple and supreme and all out of the same bag. It’s just as good as the old Rainbow flash combinations were. You don’t have to pull out one strand here and two there, mix and tangle. Here you can just get going. 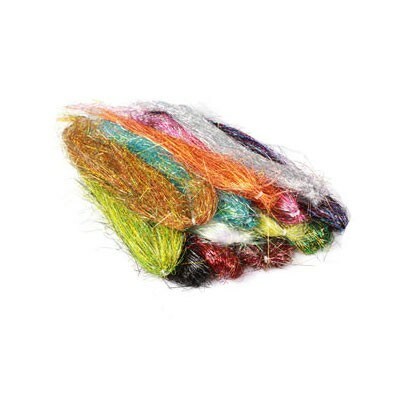 You find the 15 fine color blends that suit everything from the lightest fly to the extra spicy night flies. The flash is not too stiff and yet not soft enough to tangle. This is a flash that swim perfectly, in the fashion that I always have intended my flies to swim. Modified Sproat bend, wide gape, x-strong hook, ideal for salmon, sea trout and steelhead tube patterns. Grip Mini Ostrich Plumes, good clean colours on quality feathers. Ideal for Spey and Intruder patterns. !0 plumes per pack. Larva Lace Salmo Supreme was inspired by salmon fly tiers in Norway and Sweden. A blend of Angel Hair and tri-lobal.